We are a Leading Manufacturer and Supplier of Christmas Decorative items like Hanging Hearts, Star, Tree, Bells etc. These Decorative Hanging are Mainly Used in Christmas, Wedding, Parts, Home Decoration, Garden Decoration and are Available in Various Finish. Assisted by our team of artisans, we are able to address the requirements of our clients in an optimum manner and provide them a range of Lac Christmas Hanging products which feature various striking designs and colorful patterns. Our craftsmen are engaged in a comprehensive study and analysis of the requirements and are able to provide them products accordingly. Due to the enthusiastic efforts of our professionals, we have been able to provide a broad array of Hanging Ball. 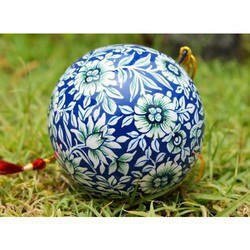 Beautiful wall hanging balls can be used as wind chimes also. We present an exclusive array of Decorative Hanging Ball that will enhance the beauty of place. Our Decorative Hanging Lanterns are brilliantly designed to suit all kind of interiors. Besides, we are able to provide customized designs to our clients as per their specification. Above all, we have settled ourselves among the popular Hanging Candle Lanterns Manufacturers based in India. 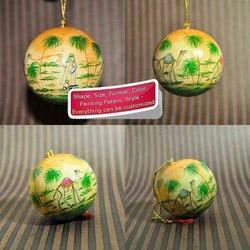 The mesmerizing artistry done to create these dazzling designer Christmas Hanging Balls. Accentuated with golden bow, the hanging balls are is certain to give an exclusive look to the environs.